12 Last drinks Time to say ‘adiós’ to alcohol? Jean Hailes is committed to bringing you the most recent evidence-based information. All articles go through rigorous review with experts. References are available upon request. Jean Hailes for Women’s Health gratefully acknowledges the support of the Australian Government. JM: It’s great to have you on board, David. I’m proud and honoured to have been appointed to my new role as Patron, spreading the Jean Hailes word across the country. How are you settling in? DL: You’ve built this house on very firm foundations, so it makes my goal of growing the organisation relatively easy. My vision is to keep building on what’s already here – providing women with a first-class clinical service, ensuring all women are as well informed as possible and that all our work is backed by the most recent and relevant research. JM: What led you to become CEO of Jean Hailes? DL: A long and winding road, through the public service in New Zealand, higher education management, and a long stint in medical research. All these experiences are in use now in this job. My wife and I have three adult daughters, so I have seen first-hand the truth of what Dr Jean Hailes said – ‘if a woman is in good health, her family, community and the society around her also benefit’. That really resonated with me. JM: What are your plans for growth? DL: Responding to the diverse needs of women across the country demands a nationwide network of clinics based on our two Melbourne models. We’re also developing a research network that I hope one day will link into every university and medical research institute that is conducting relevant research. And of course our public health information program will continue to be the most sought-after source of information for patients and health practitioners in all aspects of women’s health. This underpins everything that we do. JM: Thanks David, we all have so much to contribute here at Jean Hailes to help women live healthy and happy lives. This year’s Women’s Health Week is shaping up to be another fun-filled and informative week for women all around Australia. From 2-6 September, 2019, Women’s Health Week encourages all women to put themselves – and their own good health – first. An annual Australia-wide event since 2013, it has grown hugely in six years. In 2018, not only did more than 100,000 women take part in the week, but 92% of these women said they were making positive health changes because of the information they received during the “Than week. the botto k you from m of my In 2018, investing in wome heart for n annual e more than vent is m ’s health. This a d k if ing a ge fe 2100 events renc nuine women li e in the lives of countles ke me. B – including s y encou changes rag in daily morning activitie ing small to signif s, it has le icant im d teas, health p life and the lives rovements in my of my fa checks network mily and within th our e comm and group unity.” Cheree training D (aged 35 -44) sessions – were NSW held around the country. Around 25,000 women also signed up to receive free daily health-related emails during Women’s Health Week. This year, Women’s Health Week will reflect our commitment to caring about women and the communities they live in. We will reduce our carbon footprint by removing single-use promotional material. We look forward to your support. HEALTH PROFESSIONAL UPDATE Webinar update New webinars available on the Jean Hailes website for professional development: ‘Why ask about vulval health?’ Specialist women’s health GP Dr Felicity Dent discusses a range of vulval presentations often seen in clinical practice. ‘Endometriosis: an overview’ Jean Hailes gynaecologist Dr Neelam Bhardwaj presents an informative overview of endometriosis, including diagnosis, pathogenesis and impacts on mental health. ‘An introduction to family violence’ Karen Bentley from WESNET presents an introduction to addressing family violence in clinical practice, from how to ask your patients, safety planning and referral pathways. Polycystic ovary syndrome (PCOS) update In line with the new polycystic ovary syndrome (PCOS) treatment guidelines, we have updated the PCOS active learning module (ALM) and PCOS health professional tool. Both are designed to help health professionals improve care and management of women with PCOS. New PCOS consumer booklets are also coming soon. Small wonders How to nourish your gut bacteria, and why it can benefit your whole health. eaten, resistant starch is created, explains accredited practising dietitian Kim Menzies. “As it avoids digestion, it makes its way to the large intestine where it can be fermented [or eaten up] by the good gut bacteria,” says Ms Menzies. The end products of fermentation, short chain fatty acids, are “excellent for the health of your intestinal cells”, fuelling the ‘good’ gut bacteria and helping to reduce gut inflammation. Add and subtract The key to a healthy microbiome may not only be what you put on your plate, but what you leave off it. Researchers are finding that certain food additives, common in packaged and processed foods, may harm gut bacteria and, in turn, your overall health. Two common emulsifiers (chemical agents used to give processed foods a smooth texture or extend their shelf life) were tested on mice and found to not only reduce levels of healthy gut bacteria and increase levels of inflammatory gut microbes, but also put them at increased risk of chronic disease. Artificial sweeteners may also be a cause for concern. Often used in ‘diet’ or ‘sugarfree’ products, animal studies have shown that these additives disrupt the balance and diversity of gut bacteria. However, as Ms Villella explains, the key to knowing what’s in your food is to use less packaged foods and build your diet around natural whole foods. “Keep ‘sometimes’ foods to sometimes only, check food labels for numbers and additives, and where possible, use simple natural ingredients and make your meals from scratch,” she says. by liquid throughout the fermentation process. If it is not, mix 1 tbsp salt with 2 tbsp water, add to jar and press mixture down firmly. Repeat as necessary. Cover jar top with fabric, secure with elastic band/string. Store in pantry, out of direct sunlight, and allow to ferment for 10 days. Then, move it to the fridge and enjoy! Nutritional information Traditionally-made sauerkraut has had a long journey throughout human history and can be traced back to 400 BC. Sauerkraut can be used in many ways. Add it to salads, sandwiches, wraps and burgers, or serve as a side for roasts, vegies, curries, casseroles and stir-fries. It contains vitamins A, B, C and K, various minerals, live lactobacilli (beneficial gut bacteria, also known as probiotics) and a large amount of lactic acid. It is best eaten uncooked to preserve this good bacteria. Cabbage is also a prebiotic, feeding existing healthy gut bacteria. Pain and the pelvis With the opening of our first persistent pelvic pain service, we talk to Jean Hailes gynaecologist Dr Janine Manwaring about pelvic pain treatment. ersistent pelvic pain, also known as chronic pelvic pain, is a common condition that affects around 15% of women worldwide. Chronic pelvic pain has been described as a ‘silent epidemic’ because it’s poorly understood and underdiagnosed. The condition is also often overlooked because of the incorrect belief that period pain is normal and a natural part of being a woman. However, the impact of chronic pelvic pain is large. It is the most common cause of days off work for women of child-bearing age and costs Australia around $6 billion annually. The good news is, recent research shows that women suffering from pelvic pain can reduce their symptoms and improve their quality of life – particularly if surrounded by a supportive medical team. muscles, bones and nerves, chronic pelvic pain is a complicated condition. Its symptoms can vary, and it can have many causes. It may even be a symptom of another disease. One of the most common types of pelvic pain is due to a condition called endometriosis, which occurs when cells similar to those that line the uterus are found in other parts of the body. Chronic pelvic pain has been described as a ‘silent epidemic’ because it is poorly understood and underdiagnosed. Some women with endometriosis have painful periods, while others have symptoms associated with the bladder, bowel and/or pelvic muscles. It can also affect psychological health (eg, low mood, anxiety) and can be associated with headaches. PAIN EXPLAINED When something painful happens, the nerves in the affected area send pain signals to the spinal cord and then up to our brain. There are two types of pain: short-term pain, and longterm (chronic) pain. Short-term pain Short-term pain is how our body tells us something is wrong and to react to protect ourselves (eg, pulling our hand away from the touch of a hot pan). Short-term pain goes away after a time. Chronic pain Chronic pain is when the pain doesn’t go away. The original cause of the pain may no longer be there, but the nerves start sending pain impulses to the brain at any time, not just when there is pain. With chronic pelvic pain, the pain pathways from the pelvis to the brain change. This is called ‘central sensitisation’ and once this happens, pain in the pelvis becomes complex. Things that weren’t painful can become painful (eg, wearing tight jeans), and the pain can spread to a larger area. Central sensitisation is also common after shingles, sporting injuries or other conditions with long-term pain. Phantom limb pain – the pain that is felt after a limb amputation – is another example of central sensitisation. have shown that chronic pain patients respond to pain in a different way to healthy patients. “Chronic pain patients appear to have altered brain function and structure,” says Dr Manwaring. “They can become ‘hardwired’ to pain and their body may start to feel pain even without a trigger or cause.” Yet promisingly, says Dr Manwaring, there is evidence to show that such brain changes can be reversed with the right individualised treatment. Chronic pain management Managing chronic pain is about recognising the condition, and then creating a treatment plan to manage symptoms. The aim is not for a cure; rather, it is for the patient to be able to live with the condition in a manageable way and have a good quality of life. Team approach Chronic pelvic pain is best managed by a team of specialists. This is known as a multidisciplinary approach. The team may include a gynaecologist, pain specialist, GP, psychologist, pelvic physiotherapist, dietitian and nurses. Specific treatment may include surgery or physiotherapy. Overall physical health will also be addressed, for example, through nutrition and exercise. The team provides a medical pain management plan, in addition to teaching patients how to manage the pain themselves (eg, pain science, triggers and management). “We treat underlying mood issues, as well as teaching mindfulness – both of which can significantly improve the woman’s quality of life,” Dr Manwaring says. 3 THINGS TO KNOW: 1. Chronic pelvic pain occurs in the area below the belly button and above the legs, and is defined as pain felt on most days for six months or more. 2. With chronic pelvic pain, the pain pathways from the pelvis to the brain change. This is called ‘central sensitisation’. Once this happens, the pelvic pain becomes complex. 3. Chronic pelvic pain is best managed by a team of specialists. This is known as a multidisciplinary approach. Women’s Health Week is a week for every woman in Australia. How can you join in? womenshealthweek.com.au Jean Hailes is supported by funding from the Australian Government. Last drinks? As more research links alcohol with ill-health, is it closing time on Australia’s love affair with booze? uring Australia’s penal era, more alcohol was consumed per person than at any other time in history. Rum was even used as currency. Today things are different. The Australian Bureau of Statistics says that Australians are drinking at the lowest level in 50 years, amounting to around 2.6 standard drinks per person per day. Yet the recent headlines about alcohol have been … well … rather sobering. The largest ever study to assess alcohol and disease has concluded that there is no safe level of drinking alcohol. This news is especially worrying for women, given that alcohol is more toxic to women than men, and takes longer to process. This is due to the smaller percentage of water in a woman’s body, and because the protein that breaks down alcohol is produced in smaller quantities in smaller livers. The study, published in the international medical journal The Lancet, showed that three million deaths globally were due to alcohol use in 2016. The findings mirror other studies which link alcohol with premature death, heart disease, and cancer, particularly breast cancer. In Australia alone, more than 5500 lives are lost every year due to alcohol use. Jean Hailes endocrinologist Dr Sonia Davison says there is a lot of debate about what is ‘safe’ alcohol use and the study reinforces the overall message “that zero alcohol intake is safest”. The 2018 Jean Hailes women’s health survey, which surveyed more than 15,200 women across Australia about their health, revealed that 9.5% of women drink alcohol every day. Of this, 13.7% of women aged over 50 reported drinking alcohol daily, compared to 2.2% of women aged 18-35. A 2018 poll by the Foundation for Alcohol Research and Education found 45% of Australian drinkers consume alcohol to get drunk, and – not surprisingly – that 73% of people believe that excess drinking is a problem in Australia. Alcoholic beverages are a group 1 carcinogen, meaning they’re as dangerous as smoking. Alcohol causes seven different types of cancer – mouth, throat, oesophageal, liver, stomach, bowel and female breast. Cancer Council Victoria’s Alcohol Legal Policy Adviser Sarah Jackson says that most Australians are unaware that alcohol causes cancer. “Cancer Council Victoria recommends that to minimise the risk, people should avoid alcohol altogether,” she says. “But if people do choose to drink, then limit to within the guidelines,” she says. Breast cancer and alcohol While drinking alcohol doesn’t automatically mean you will get breast cancer, research shows that the more you drink, the greater your risk. Women who drink one standard glass of alcohol each day have a 7% greater risk of breast cancer when compared to women who don’t drink. Alcohol use is believed to cause 6% of breast cancer cases each year in Australia. Although the exact link is not fully understood, it is known that: •	alcohol increases the levels of the hormone oestrogen. High levels of oestrogen can cause a cancer cell to multiply out of control •	alcohol is broken down by the body into a substance called acetaldehyde, which can cause changes in our DNA. This can cause cancerous cells to grow. Gillian’s tip Segment the week. Keep your weekdays alcohol-free, so that you can enjoy a couple of drinks on the weekend. Getting started Anyone concerned about their drinking can talk to their local GP or other health professional for support. Ms Needleman also asks her clients to consider the following when planning for change: Self-reflection Assess why you’re drinking in the first place – this helps to identify the ‘cause’. Goal setting Make a plan – set an overall goal and then segment in to smaller, measurable targets. Plan Substitute drinking with another activity, eg, walking, yoga, reading. Identify which days of the week you find it more difficult to abstain and think of an alternative activity. Set new rituals At home, don’t sit in the same chair that you would normally drink in. Add cucumber and lemon to soda water. Make it interesting/tasty. Monitor self-talk Combat negative self-talk with some positive thoughts or affirmations. Respect the process of change If you don’t meet your targets one week, acknowledge it, and then put it behind you. Look ahead to what you can do differently next week. You’re not the only one Use websites such as Hello Sunday Morning, which frame alcohol-free living in a positive light and help to remind you that many others are trying to change too. 3 THINGS TO KNOW 1. Largest-ever study confirms no safe level of drinking alcohol. 2. Alcohol is more harmful for women than men, and increases the risk of breast and other cancers, heart disease and early death. 3. Women can enjoy improved health and wellbeing by reducing alcohol intake. 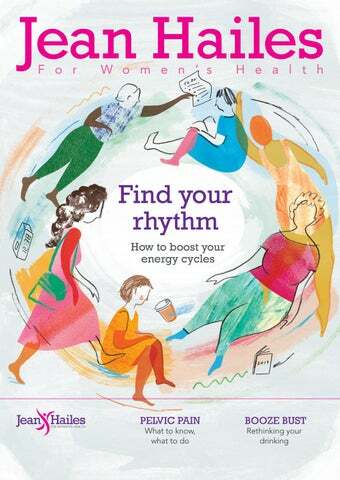 Finding your energ y rhythm Is there a hidden pattern to our energy levels? If so, how can we use it to our advantage? rom a bouncing buzz to drop-dead fatigue – the highs and lows of everyday energy are tricky to navigate. And if you feel like you’re always running on empty, you’re not alone. Dr Sonia Davison, endocrinologist (hormone specialist) at Jean Hailes for Women’s Health, says fatigue is common among women, moreso at certain life stages. “Women often take on many roles – carer, worker, parent, partner, volunteer,” she says. For many women … peaking hormones align with the time of day they feel most productive. woman is different and while many women operate better in the first half of the day, other women find they function better at night, irrespective of their hormone levels. The key is to observe your own natural rhythms, and find what works for you. A secret map of the month As well as dancing to a daily rhythm, other hormones have us moving to a monthly one. Research in the past five years has revealed that female hormones may be writing a secret map of the month ahead, telling you which days you’re more likely to be bursting with bounce, and which days you’ll be best off taking it easy. Jayashri Kulkarni, Professor of Psychiatry at Monash University, says that for women having periods who aren’t on hormonal contraception, the pattern of monthly hormones can be “absolutely connected” to the levels of energy they feel. “Hormones such as oestrogens, progesterones and testosterone have an impact obviously on the female reproductive system, but they also have a major impact on brain chemistry,” Prof Kulkarni says. Oestrogen & energy In terms of energy levels, oestrogen, put simply, is the “good” hormone, says Prof Kulkarni. “It’s protective to the brain and a natural, mild antidepressant.” At day 1 of the menstrual cycle (the first day of your bleed), oestrogen levels are low. They begin to pick up around week 2, and peak sharply in the days before ovulation (egg release). This means that, in a 28-day menstrual cycle, it’s common for women to feel more energetic around days 12-14. What about ‘the Pill’? What goes up must come down In this way, being more in tune with your cycle can take forwardplanning to the next level. Big presentation at work? Training for a half-marathon? When possible, it may pay to schedule those big life events mid-cycle, when oestrogen is up. 3 THINGS TO KNOW 1. Fatigue is common, but if it’s greater than you would normally expect, or if it worries you, see your doctor. 2. Female hormones can influence brain chemistry and fatigue levels. 3. Observe and track/write down your own energy rhythms, to find what works for you. Jean Hailes for Women’s Health Endocrinologist Dr Yvonne Chow We talk to Jean Hailes endocrinologist Dr Yvonne Chow about her fascination for hormones, passion for public health, and love for her baby daughter. What does an endocrinologist do? An endocrinologist is a doctor who is trained to diagnose and manage diseases that affect the glands and hormones within the body. Our aim is to help the patient to restore hormone balance. What are some of the common conditions you see in your patients? The most common conditions I see are diabetes, thyroid disease, osteoporosis, polycystic ovary syndrome, menopause, adrenal disorders, and neuroendocrine conditions. What drew you into the field of endocrinology? How do you treat hormone issues? I find hormones fascinating. Hormones are how the body communicates. The endocrine system’s glands and organs secrete hormones, which are the chemical messengers that help various parts of the body to function. I love the fact that we can measure the quantity of hormones in the body as this can really help us treat the hormone imbalance of various conditions in a very targeted way. Most hormone problems are very manageable. For example, if your thyroid does not produce enough hormone, we can supplement with thyroid hormone. What are some signs that your hormones are out of sync? Fluctuations in weight and irregular periods may point to a hormone imbalance. Other signs may include persistent problems with acne as an adult, excessive hair growth on the face, jawline, upper back, chest, as well as unexplained irritability, and mood fluctuations. How has being bilingual (English, Cantonese) helped you with patient care? Being able to reach people in a language other than English means that I can immediately improve the rapport with Cantonese-speaking patients. My background also helps me to relate to women from migrant backgrounds generally. You recently completed a Master of Public Health from Tufts University School of Medicine in Boston, US. What were some key learnings from this course? At a broad level, I see the value in having good public health policy and systems in place. For example, I can see around 20 patients per day and help the health of those 20 people. A good public health policy can change the health of thousands or millions of people. We need good policy for good health. I also learnt a lot about different healthcare systems, which has helped me to appreciate the Australian healthcare system. What advice would you give to women today in relation to their health? In a very busy, modern lifestyle, women often do not prioritise their own physical and emotional wellbeing. My advice for women is to ensure they make time to eat well, do regular physical activity and of course, spend time doing things they enjoy. Maintaining a healthy body weight is particularly important for hormonal conditions such as type 2 diabetes and polycystic ovary syndrome. Exploring women’s health issues and concerns. Our fourth annual Women’s Health Survey reveals the health needs and behaviours of women across the country. More than 15,200 women aged 18 or older and living in Australia responded to our 2018 survey. Health needs While more than 50% of women were totally confident asking their doctor questions, and discussing health issues that concerned them, one in five had questions they avoided discussing. To improve your confidence when seeing your doctor, read up on a topic from a trusted health website (eg, jeanhailes.org.au, betterhealth.vic.gov.au). Write questions down before you visit your doctor to get the answers you need. And don’t be afraid to ask a question more than once to make sure you understand. Staying active, eating nutritious food, limiting alcohol and not smoking are four key ways to maintain good physical health. To stay more active, increase your daily incidental exercise (eg, take the stairs instead of the lift) and exercise with friends to keep it fun. Try a weekly meal plan, buying only the ingredients you need. This will not only make it easier to eat healthily, but will reduce waste. Your women’s health questions answered by our experts. When it comes to women’s health, there is no such thing as a silly question. Answering your questions for this edition of ‘Ask Dr Jean’ is Jean Hailes endocrinologist (hormone specialist) Dr Sonia Davison. This easy-toprepare breakfast can be a delicious friend in the fight against pelvic pain. Method Prepare the night before. Combine seeds, spices and walnuts in the jar. Add coconutalmond milk, then maple syrup and stir well to combine, ensuring any seeds at the base of the jar are not left dry. The mixture should be quite runny, as the high-fibre seeds will then absorb the liquid. Refrigerate overnight. In the morning, serve with chopped strawberries. Yes, it’s that easy! is that a diet higher in the ‘good’ fats and lower in the ‘bad’ fats may help to lower a woman’s risk of developing endometriosis, or, for a woman with ‘endo’, help ease the abdominal pain. Avoiding trans fatty acids – often found in commercial baked goods like cakes and pastries – also has been shown to reduce the risk of endometriosis. Omega-3 polyunsaturated fatty acids (PUFAs) are known as ‘good’ fats. Of the three main omega-3s, two are found in fish, while one – alpha-Linolenic acid (ALA) – is found in plants. Hemp seeds, linseeds, chia seeds and walnuts are the best sources of ALA and are all in this breakfast jar for a great serve of omega-3 PUFAs. These omega-3 fats can also help to fight substances in the body that cause inflammation, working much like how drugs such as aspirin and naprogesics do to reduce pain. The seeds are also high in fibre, which is important for managing symptoms of IBS such as constipation and diarrhoea, and may ease painful bloating. Fibre also provides fuel for the gut microbiome, encouraging a healthier gut. Aromatic spices, including cinnamon and cardamom (also in this recipe), contain oils that not only provide the sweet-smelling flavour and scent, but are also traditionally used in herbal medicine to calm potentially painful gut spasms. For those who struggle to have breakfast before leaving the house, this easy five minutes of preparation the night before makes this breakfast jar convenient to take to work, and is perfect for those who exercise before work. If coconut-almond milk isn’t to your taste, you can swap it for another milk. Just note that the recipe may no longer be dairy or gluten free. I like this combination for the warmer months. In the cooler months, the ground seeds and spices can be used to top porridge. This recipe is an example of choosing healthy fats over unhealthy fats, to help reduce inflammation and pain one spoonful at a time. 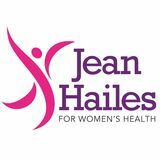 Founded in 1992 in honour of an extraordinary medical practitioner, Dr Jean Hailes, Jean Hailes for Women’s Health reflects the enduring legacy that Jean made to women’s health. She had a far-sighted vision to improve the quality of women’s lives and give them practical information based on the best available evidence. She is credited with being the pioneer of menopause management in Australia. Today, Jean Hailes is Australia’s leading and most trusted women’s health organisation, combining clinical care, evidence-based research and practical education for women and health professionals. We aim to translate the latest scientific and medical evidence in order to inspire positive change in women by improving their physical health and wellbeing. This magazine is environmentally sustainable.